The massive land yachts of the that rolled off of Detroit assembly lines until about 1980 are mostly gone. Mostly, that's a good thing. They handled like crap, took up a lot of space in parking lots, and guzzled gas. But they had a certain, uniquely American charm. They were roomy, commanded attention, and oh the mighty songs played by their horns! Newer cars, while cheaper to run and easier to park, lack the harmonic, train-like boom produced by an old Cadillac's quartet of horns. Your car may have a wimpy little horn, but that doesn't mean you have to settle for it. Here's how to make your horn sound with the power of Brünnhilde's Immolation. I had a weak horn problem in my beat up mid-'80s Subaru — actually, the horn didn't work at all — so I decided it was time to give my anemic econobox the powerful voice of a malaise-era diesel locomotive Cadillac. Now, when I hit the tiny red button installed on the dash, heads snap toward the huge sound coming out of my relatively small Japanese car. Like many other Americans, I have have a penchant for pointless noisemaking, so only a horn fit for a pimp passes muster. Finding horns: Time for a trip to the junkyard. 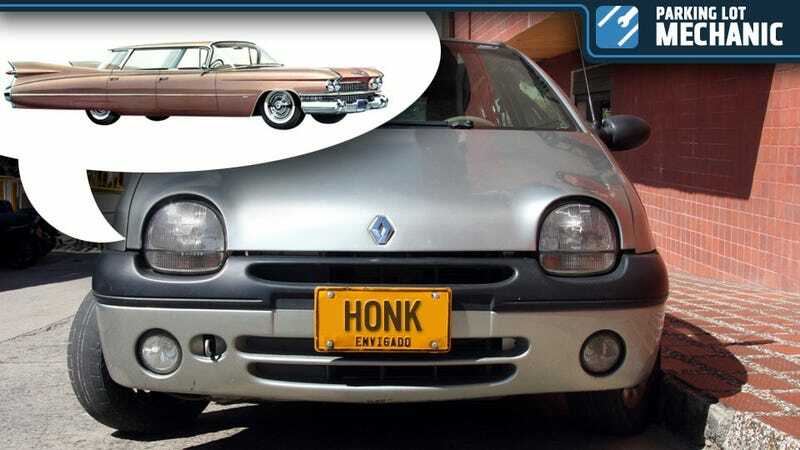 Horns from any big car will do, but if you're the type who'll settle for nothing less than the best, go for the four-note train horn from an old Cadillac or Buick. GM's two-note horns were loud, and the four-note setup ridiculously loud. Cadillac used them on most of their cars until about 1980, then on the DeVille until about '85 (when the DeVille became a mid-sized specter of its former self), and they were also in Fleetwoods and Buick Roadmasters until the early '90s. Make sure you have all four notes — A, C, D and F. The note is printed near the bell of each horn. Electric parts: To make your faux train horn work, you'll need to put in a button somewhere. You could wire it to your car's stock horn button, but I just wired in a different switch for easier installation, and because I wanted to have the option of using the car's normal horn if I ever decide to fix it. You can get all of this stuff from Radio Shack. You'll need a single-pole-single-throw, normally open momentary switch, a 30-amp automotive relay, a 15-amp inline fuse, and some 16-gauge wire (enough to reach the mounted horns, the car's battery, the relay, and the switch on the dash). Mounting the horns: Luckily, GM horns only have one wire coming out of them. As long as you bolt them to a patch of bare metal, the ground is all taken care of. On my car, there's a lot of space in the engine bay, so mounting all four horns near the front was easy. In some cars, you may have to drill holes somewhere and bolt the horns up under the bumper or next to the radiator. Just make sure you don't drill into the radiator or a bunch of wires or something. That'll ruin your day. Wiring: Once the horns are mounted (assuming they're mounted in roughly the same place), you can run their wires together into one, then run a jumper from that junction through the firewall (if you're planning to mount the relay inside the car like I did). Take a look at the wiring diagram shown here to see how to connect the horn's hot wire to the switch, the relay, and the battery. You can use an awl or pick to pry open a space in one of the firewall wiring harness grommets to feed your horn wire through. For a hot lead, pick a power source that's hot when the ignition is on or off, so that you can honk at people when the car is keyed off. I put the relay behind the dash, but you can put it anywhere that's dry and relatively cool. Button placement: This is more important than you might think. You should definitely go for as large a button as possible (so you're not fumbling around for the button when you need to fend off potential collision recipients), and try to put the button someplace where you can reach it easily, with one smooth motion of your arm/finger. I put mine right below my stereo, near where my hand goes anyway to change the volume. The rest is training your arm to jab at something other that the center of the steering wheel when you're threatened/pissed/trying to get someone's attention. Once you have it all together, test it out. Feels good doesn't it? You might not be driving a huge Cadillac, but that's a horn that would make Super Fly beam with pride. And the best thing? You can get everything you need for less than $30 if you shop around. Nothing you could get in a kit from J.C. Whitney would be that cool (except maybe for the La Cucaracha air horn set), and parts supplier stuff costs a lot more. If you end up trying this out, please post a video of your new horn and the reactions of innocent bystanders in Kinja. Because that would be awesome.